It seems that there are few paintings of St. Timothy in Western art, probably because the Scripture doesn't associate him as a leading character with a particular narrative. Primarily what is available online are contemporary icons. Jan van Eyck (1390-1441), "Portrait of a Man (Timothy)" (1432), oil on panel, National Gallery, London. Portrait of St. Timothy, Santa Pudenziana, Rome. 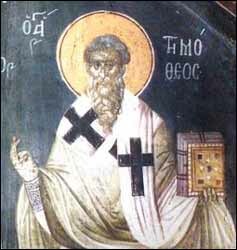 A tradition at Rome has Timothy as the son of St. Pudens, a Roman Senator who hosted both St. Peter and St. Paul in his home and who also fathered SS. Pudenziana, Praxedes, and Novatus. 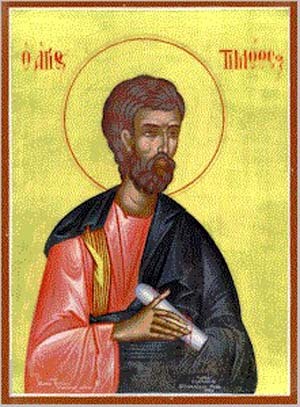 Timotheus (late 14th - early 15th century), fresco in Gračanica Monastery (Kloster Gracanica, Serbian Orthodox), Kosovo. Shown with Cyril of Alexandria. St. Timothy stained glass window, location unknown. Timothy reading a book. Edward Burne-Jones, St. Timothy and His Grandmother Lois (c. 1872), Vyner Memorial Window in Oxford Cathedral. St. Timothy with the martyrs' palm, removed from Neuwiller Abbey. Eunice Teaching Timothy, Trinity Church North Transept Stained Glass Window, Boston, MA. Companion of Paul on his missionary journeys and referred to by Paul as "the beloved son in faith." Reputedly beaten and stoned to death for denouncing the worship of Diana. First Century. Avarice. Canvas, 67.9 x 57.5 cm, The Kremer Collection. Woman counting coins by candlelight. AllPosters. Lars Justinen (1955- ), "Inspiration," based on 2 Timothy 3:16. Hand with pen on writing parchment.